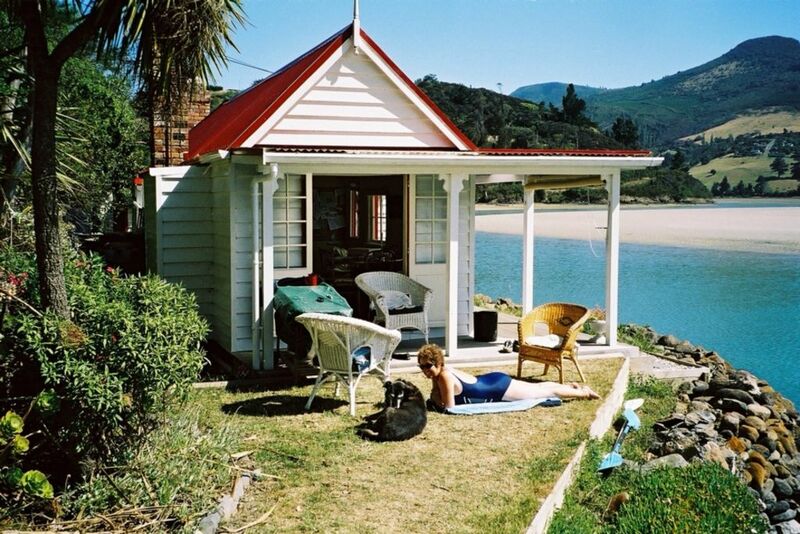 Restored 140 yr old cottage on the very edge of the sheltered Purakaunui inlet, just a scenic 25 min drive from Dunedin. Although still faithful to it's historic roots, there are the home comforts of a full modern kitchen and bathroom. The rooms are tastefully decorated, cleaned and maintained to a high standard. There is electric heating in every room as well as a coal range. Electric blankets are on the beds except for the trundler in main house. As featured in Life and Leisure Magazine, Jan, 2009. The cluster of four little buidings known as "As You Like It" since the 1930's, is a 100 metre walk down a path along the waters edge. You can just sit on the deck and watch the fish just a metre away, or watch the sunset over the water, dig for cockles, fish off the deck or the rocks, walk along the ocean beach or row or canoe around the inlet. It's a great bird watchers spot- shags ,tuis, fantails, bellbirds, oystercatchers, woodpigeons, whitefaced herons, kingfishers, etc. A Dinghy or kayaks are available onsite. The white sandy beach can be accessed at low tide by walking across ankle deep water, or by canoe. At full tide the bay is full of water and great for a kayak around the bay. Outings can include a visit the historic pa site, Motutapu and it's secluded beach, or the Orokanui Sanctuary, 5 min drive away. The new Dunedin Forsyth Barr Stadium is only 20 min drive away, access and parking is easy because you can avoid the crowds coming from the city side. It is also a great base to visit Dunedin's attractions , Port Chalmers is a 10 min drive away, with designer clothes and jewelry shops as well as coffee bars and restaurants. Eating out options include the Carey's Bay Hotel overlooking the fishing village beside Port Chalmers, or Fleur's Seafood restaurant at Moeraki. The unspoilt coastal settlements of Seacliff and Karitane are a short senic drive away. There are many walks around the township and the boatsheds, along Purakaunui beach, around the inlet or to Longbeach. Note:unsuitable for the mobility challenged. Note that each bedroom-and the bathroom -are in separate cottages. The single bed in the main house is a trundler stored under the double bed. The buildings are clustered together and there are only a couple of steps between each cottage. Security lights light the way. Please discuss bringing pets with us. Complimentary Clothes washing available nearby. Check-in time after 3 pm check out by 11 a.m.
My grandfather first brought a house in Purakaunui in the 1920’s and it has been a family favourite ever since. I was brought up in Dunedin, taught at a local high school, went back to University as a young mum and trained as a clinical psychologist in the 80’s. Buying As You Like It was a childhood dream and we spent many years bringing it up to modern living standard and restoring its original features. After 20 yrs as a psychologist, I brought a country hotel in Naseby, Central Otago as a complete change. The goal was to restore the 1863 building as I had As You Like It. Now life is a bit more peaceful, living at Purakaunui and enjoying seeing people enjoy Purakaunui as I do. It is so unique.. a modest, charming and likeable house close to the water. So close it feels like living in a boat.. but not getting sea sick. As a child I always wanted this place... so intimately close to the sea and so easy to get back home to get warm and dry after a days adventures in the sand and sea. The only traffic is by boat or walking which makes for such a peaceful place, yet not isolated. I love the sense of history, getting a feel for how people lived a hundred years ago, but still enjoying some modern comforts. Historic and unique to be so surrounded by the sea. Just half an hours drive from Dunedin, or 15 minutes to Port Chalmers for a lovely village feel with restaurants, food and artisan shops as well. About two steps from your front door! Farmland surrounds Purakaunui. Sheep and cattle grazing are the main types of farm. The friendly village of Purakaunui consists of about a hundred houses set amongst the trees in a sheltered bay. Overlooking an ever changing inlet... great for boating and paddle boarding at high tide, exploring rock pools, collecting cockles, swimming and playing on the white sand banks at low tide. Absolutely. Right on the edge of a tidal inlet. You can fish or swim from the deck. One of the best Surf breaks 100 metres away. Surf beach of Purakaunui a short row or 20 min walk at low tide. Mt Mopanui, a volcanic cone, is in your view and can also be climbed. The drive from Dunedin is very scenic, with many mountains around. The north coast of Dunedin has many largely unpopulated white sand surf beaches including Long Beach, Cave Beach, Murdering Beach, Canoe Beach all within a few minutes from Purakaunui. Watching the tide ebb and flow is a favourite occupation of guests. Fish and shellfish, seabirds and seaweed all in a peaceful environment. A natural aquarium right by your frontage... birds, fish.. even seals and octopus at times. Electric heaters in every room, electric blankets on the beds. Bed linen, tea towels, dishcloths and scourer. There is an historic cooking fireplace but it smokes too badly to use. Parking for 1 car, more roadside parking within walking distance. There is a sack barrow at the cottage to use when unloading. Free wifi and landline as well. A coal range which can keep the whole cottage warm, heat the water and fun to cook on if you want to experience life from yesteryear! Plenty of glasses, crockery, pots, pans and serving dishes. 32 inch flat screen. Radio, tape and CD player. That is, the whole bay and surf beach as well! The Orokonui Sanctuary is 10 min drive away. Native birds including kaka and kiwis as well as native flora are kept here in a predatory free environment. You can watch the birds at the feeding stations and there are guided tours. The Forsyth Barr Dunedin Stadium is also only 25 min drive away. Purakaunui can be an excellent place to stay, with easy access and parking on the non town side of the stadium, avoiding the traffic jams on the town side. Dunedin itself is a charming city with a lot of Victorian architecture, great cafes and restaurants, an award winning farmers market and many beautiful artworks on the side of buildings. There is an emphasis on wildlife in Dunedin and its surrounds. The Otago peninsular is a favourite tourist destination for this, with an Albatross colony, penguins and a penguin hospital. The Monarch, a small tourist launch can take you outside the harbour entrance to view the rugged coastline, seals and sea lions, flying albatrosses and other seabirds. Sometimes porpoises join the excursion! Walks along the beaches by Purakaunui reveal caves and tunnels to walk through at low tide. Cockle ( little neck clams) and mussel gathering is a favourite pastime of many visitors to the area. Boating, kayaking and paddle boarding are also favourite pastimes in the sheltered bay and there is a slipway to launch sea going boats at high tide at Purakaunui. Children love exploring the bay, finding crabs, limpets, sea snails and marvelling at the cormorants ( shags)and white faced herons fishing underwater. Pied 0ystercatchers parade the waters edge on the look out for shellfish which are slightly open. The sandbank is ideal for making castles and forts, playing frisbee or just running around on. Ducks sometimes swim up to the cottage to be fed and kingfishers fly by when startled. The occasional seal swims by fishing for flounder and an octopus knows how great the seawall is for a meal of crabs and snails.